For the swap, partners had to “capture” their summer in one image. Literally. Not two, three, or four images crammed into one 4×6 print or notecard, but a single image. Quite a challenge for those of us who had eventful summers. The photo features her needle tips in the “cool, funky” box she bought “cheap” recently. Thankfully, she gave an explanation. Needle tips are, part of what are called “interchangeables.” You can switch the tips with different length cords. Her words, not mine. I have no idea what she’s talking about. I had quite a number of major events myself–saying “good-bye” to friends, witnessing my little one’s choir join a 1000-voice mass choir to perform in front of an audience of 84,000 (and millions more? via broadcast), spending time with one of my beautiful best friends and her family, my dad’s 80th birthday celebration which was the icing on the cake of my summer. I probably should blog about all of that some time. But when I sat down to think about how to capture “everything,” including the many things that are not listed here, one image comes to mind. My hubby’s back issues prevented his planting a sunflower garden outside my office window, but early one weekend morning, as I was having quiet time in my home office, I noticed bright, yellow sunflowers waving to me from our “back” neighbor’s yard. I grabbed my camera and hiked the grassy field separating us and spent some time with the sunflowers. It became a special reminder of a commitment I made earlier in the year when I was faced with one thing after another–to turn to the “Sun,” the Son of God, in all circumstances. What I love about sunflowers is their reminder to us that without the Son and/or when we live in the “shadows,” we are weighed down by heaviness and dark feelings. When we face the Son, we dwell in light and we stand tall and strong in the face of adversity. Even though I am in the middle of class preparations–Heart of Darkness and Beowulf, if you’re interested–I feel obligated to take a moment to write a post. Why? 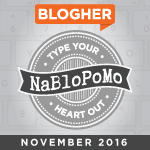 Because it has been almost a month since I last posted and because WordPress reminded me that it’s my WordPress anniversary. Typically, I ignore WP’s “pats on the back,” but three years is a long time to stick with a weblog, no matter how infrequently, randomly, and unpredictably one posts. Thank you, my little blog audience, for sticking with me. Pics and Posts is one of my happy places and I enjoy sharing my snail mail and photo adventures with you. Happy Anniversary to us! Until next time–I leave you with a little bit of happy–a poem by e.e. cummings that always makes me smile! [I designed this for a “Poetry on a Postcard” swap. I’ll be blogging about the series of swaps soon].